I’m innocently walking down 5th Avenue and as I pass Madewell, I see a sign that says additional 40% off all sale items. So how could I not check to see if the gorgeous lace dress I’ve been wanting went on sale? So I went in….and it was on sale….in my size….so I bought it. And as I swiped my credit card, I remembered that I was supposed to be trying not to spend money. Whoops. 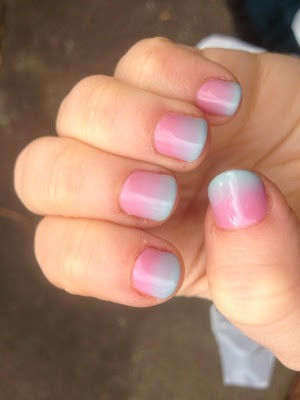 My First Real Ombre Manicure! There’s a nail salon in NYC-Valley Nails- known for it’s nail art but I never thought about going because I don’t spend hundreds of dollars or even fifty dollars on a manicure. 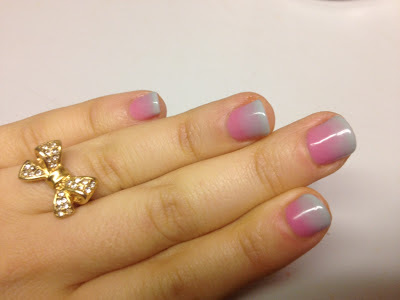 So when there was a groupon for a gel manicure with nail art at Valley Nail, I jumped at the chance to try it out! They are not the most friendly place in the world but they definitely know what they’re doing and they can do some pretty crazy stuff. I personally have no problem with bright colors and subtle nail art but I draw the line at studs and crystals on the nails. It seems so cheap to me! What are your opinions on nail art? Like it? Hate it? Only some kinds? Tell me! Tip of the day: If you’re looking for ways to spend less money on shoes and your feet are smaller than a woman’s 7 1/2, you should try the kid’s department. You think I’m joking? Totally not! The super cute leopard loafers I’m wearing in today’s outfit were purchased at Zara. I’ve also gotten kid shoes from Gap, Ugg, and J.Crew for really great prices. Generally, you go down 2 sizes so if you’re a 7, you’d be a 5 kids, a 6 would make you a size 4 kids, etc. Have any of you done this before? Obviously, I’m not going to buy a great pair of heels from the kid’s department, but a great pair of ballet flats (which makes up the majority of my shoe collection, ha ha)? Heck yes!